What Is Allspice and How It It Used? Allspice is a spice made from the dried berries of a plant known as Pimenta dioica, which is a member of the myrtle family. The flavor of allspice brings to mind cinnamon, cloves, nutmeg, and pepper. Allspice is used in Caribbean, Middle Eastern, and Latin American cuisines, among others. The versatile seasoning can be used to flavor desserts, side dishes, main courses, and beverages, including mulled wine and hot cider. The name might suggest it is a blend, but allspice is a single spice made from dried berries of the allspice tree which look like peppercorns. The allspice tree is native to Jamaica, and it is also known as Jamaica pepper and new spice. It was discovered by Christopher Columbus during his second voyage to the New World, and named by Dr. Diego Chanca. The Europeans thought it combined the flavors of several spices and they introduced it into European and Mediterranean cuisines. Allspice can be used in ground form or whole. Once ground, allspice quickly can lose its pungency. Ground spices are more intense than whole cloves or berries. Whole allspice berries are sometimes used in stews and soups, and for pickling and brining. You will certainly have better success using the ground version in desserts, such as pumpkin cake or pie, spice cakes, and gingerbread. Allspice combines the flavors of cinnamon, nutmeg, cloves, and pepper. It can be used for many purposes that those warm spices are used, or as a substitute for them. Allspice is used both in cooking and in baking. Whole allspice berries can be added to meat such as beef or lamb, as you would slivers of garlic or whole cloves. If you want to tame the berries a bit, cook them before you use them as seasoning. You can bake them for 10 minutes or heat them in a cast-iron skillet on the stovetop. Ground allspice is used to season meat, soup, stew, vegetables, and baked goods as you would use ground nutmeg, cinnamon, or cloves. It will usually be added at the beginning of cooking or baking. The Mediterranean taste of allspice shines in Cincinnati-style chili, which is a meat sauce that goes well on spaghetti or as a topping for coney dogs. Allspice is also one of the key ingredients in the marinade for Jamaican jerk chicken. Adding a scant 1/8 to 1/4 teaspoon over string beans, carrots, cabbage, or mushrooms will give vegetables a more exotic flavor. If a recipe calls for allspice and you don't have any, you could mix up a substitute by combining equal parts ground cloves, ground cinnamon, and ground nutmeg. Conversely, if you don't have nutmeg, cloves, or cinnamon on hand, use allspice instead. 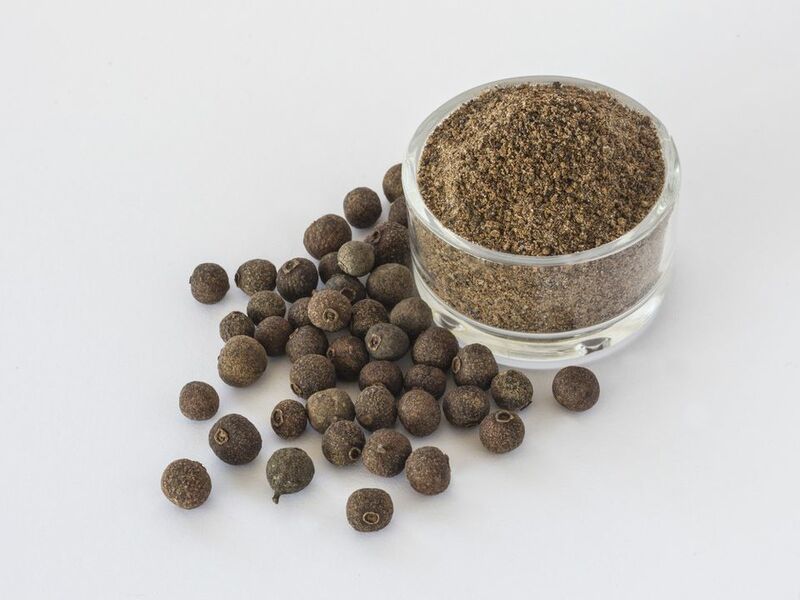 If you want to substitute ground allspice for whole allspice berries, or vice versa, the conversion is six whole allspice berries is the equivalent of 1/4 to 1/2 teaspoon of ground allspice. If you are adding the whole berries to a soup or stew in place of ground allspice, remove them before eating. Grinding the allspice berries in a spice grinder to yield the required amount is a better substitution. Freshly ground allspice will have more flavor than pre-ground allspice, so you may find you need to adjust the amount added to a recipe. The berries of the allspice tree are not the only useful part of it. The fresh leaves can give an infused flavor to dishes (like bay leaf). The wood is used to smoke meat and sausages. Allspice is sold along with other spices in the spice section of most grocery stores. You can readily find it packaged by major spice brands in both whole and ground form. Keep your allspice fresh and ready to use by storing it in an airtight jar or another container away from direct sunlight. There's no need to freeze or refrigerate it. Allspice will last for years whether whole or ground, although ground spices lose their flavor quickly. Adding allspice and other warm spices such as ginger and cinnamon to your oatmeal and other dishes can allow you to cut back on adding sugar. Traditional medicine uses of allspice include as a tea to relieve gas and bloating and a poultice of ground allspice for topical pain relief. Allspice oil contains the compound eugenol, which is also found in cloves. It has traditionally been used for pain relief and its reputed antiseptic properties. Precautions must be used, however, since allspice essential oil can be irritating to the skin and it is toxic when ingested in amounts as low as 1 teaspoon. Is White Pepper Any Different From Black Pepper? What is a Bouquet Garni, and How is it Used?